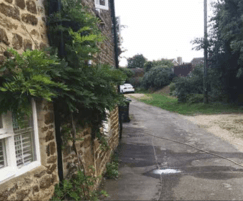 An historic stone cottage in Oxfordshire suffered from periodic flooding due to rain water bearing against the external stone wall as external roads are higher than the kitchen floor slab. Delta Membrane Systems were able to provide a complete service for the project including CSSW qualified specialists for design advice, a full range of structural waterproofing products and a network or Delta Registered installers. Given the high external ground levels, ineffective soakaway drainage would still leave the sub soil saturated at times of flood. An external barrier solution was not considered effective so the solution was to tackle the problem from the inside. A Type C Drained Protection Solution which is common in structural waterproofing schemes where external ground levels are high and there is a likelihood of water in the ground. The main components of the system are the cavity drainage membranes. These are sheets manufactured from virgin HDPE which are extruded into studs which come in various depths, an 8mm membrane used in this project. With the floor finishes and kitchen units removed a min. 50mm deep 100mm wide channel chase was cut at the wall & floor joint draining to a Delta Single V3 sump and pump unit. The chase was Bunded. The inner face of the existing wall was then lined using Delta MS500 cavity drainage membrane fixed using sealed Delta Plugs. The whole of the existing kitchen slab was lined over using 3mm profile Delta FM membrane (which is designed as an underlay for protecting oak floors) the two membranes joined by use of a wide profile DPC. The work undertaken has produced a comprehensive and long term solution for this intermittent flooding problem. The BS85500:2015 Flood Resistant and Resilient solution can be used by the homeowner to reclaim the true market value of the property.